You can buy a super affordable electric shaver but still end up with a reliable Japanese-made product that delivers what it promises. 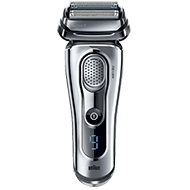 The Panasonic ES8243A Arc4 Men’s Electric Shaver can be used wet or dry, and has special “Nanotech” blades that promise a smoother closer shave. 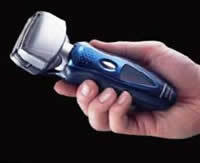 Its four blade shaving system promises to be much better than the traditional three blade shaving systems of past years. If you want to skip the cleaning and charging stations that are offered with other Panasonic shavers, then the Panasonic ES8243A Arc4 Men’s Electric Shaver will be a better choice for you. 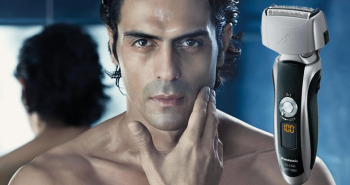 If you don’t like just a dry shave, this Panasonic shaver can also be used dry or wet. 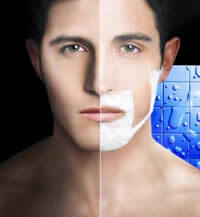 You can shave your face with water, shaving gels, lotions, and foams, to help you get the closest shave possible. 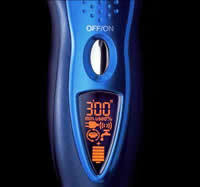 You can also bring your shaver into the shower with you, if you prefer, as it’s 100% waterproof and fully immersible. If you don’t have as much time to get ready, or want to use the shaver for touch-ups, it still does a great job when used dry. You can toss it into your briefcase if you have a super long day planned, and wish to freshen up between meetings. This shaver has not just three outer blades, but four “Nanotech” independently floating blades. There’s four outer blades and two inner blades that have a special coating to make them extra sharp. Blade angle is at thirty degrees, providing optimum cutting of whiskers. A pivoting head lets you get into all the nooks and crannies of your face. There’s even a pop-up trimmer to trim existing facial hair, so you don’t need to keep two trimming devices in your bathroom. Some of the newer shavers with all the fancy gadgets can actually be bulky and heavy, but the Panasonic ES8243A Arc4 provides a light 6.2 ounce weight, providing a firm, light grip in your hand. 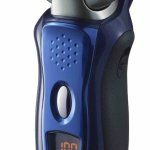 The Panasonic ES8243A Arc4 Men’s Electric Shaver has a reliable Panasonic linear motor that runs at 13,000 rpm that will cut through the thickest of beards and hairs to get the job done. Standard electric razor motors usually run at around 8000 to 10,000 rpm, so you’ll be pleasantly surprised at how fast the Panasonic ES8243A Arc4 is. If you’re on the run, the electric shaver has a quick five minute charge, so you don’t have to skip your morning shaving if the device runs low on battery charge. When charged up to full strength, it’ll stay charged up for around fourteen days before needing another charge again. A liquid crystal display on the shaver will indicate on a scale of one to ten, just how much battery charge is left, letting you know whether you need to plug it back in for charging or not. Whether the shaver is fully charged up or on its last few minutes, it’ll still provide the same powerful shave, not slowing down and tugging at hairs, which can be so annoying in other cheaper brands. Either way, the advance warning that it needs charging is a handy feature to have. 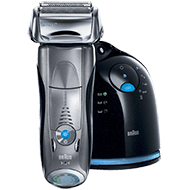 The LCD display will also remind you that’s it’s time to clean your electric shaver, so it can remain at optimum shaving performance. 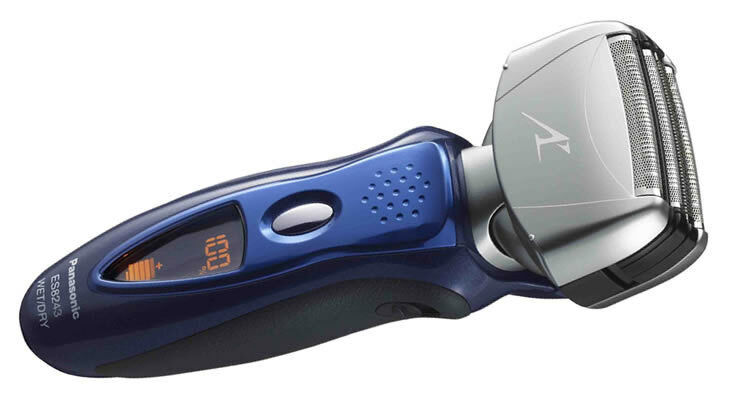 There’s a special turbo mode that you can activate, so that the razor speed accelerates up to 17,000 RPM, which will vibrate off any sticking hairs. The 100% waterproof design will enable quick and easy cleaning under a running tap, so you’re ready for the next day. 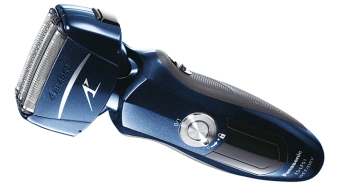 The best method to use the Panasonic ES8243A Arc4 is in a circular motion around the face, rather than the straight up and down motions in other similar linear-style razors. 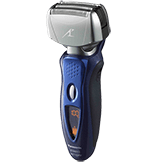 The Panasonic ES8243A Arc4 electric shaver includes the shaver, power adaptor, and a travel case in the box. Replacement packs that include new blades and foils can also be purchased separately. 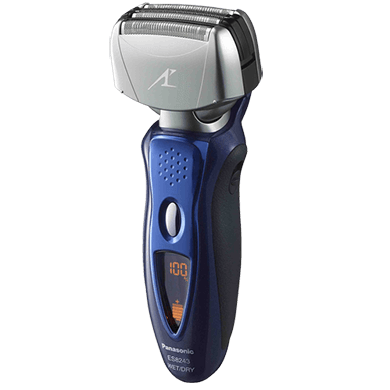 The Panasonic ES8243A Arc4 is a great shaver at an affordable price. If you still want the best shave possible, but don’t wish to pay for a bunch of fancy gadgets or settings that you’ll never use, then the Panasonic ES8243A Arc4 is the perfect shaver for you.